Everything is fine, until the moment when it is not. And when that moment comes it can be very quick and very bad. This is what Aiméry Mbounkap tells me on a Saturday afternoon in November of 2007. Mbounkap works as a site planner for the United Nations High Commissioner for Refugees. He is a robustly built man of about thirty, an architect by training and saturnine by disposition. We are sitting in the common room of a U.N.H.C.R. field office situated on the eastern frontier of the African nation of Chad, thirty-five miles from the Darfur border. Along that border, the U.N.H.C.R. 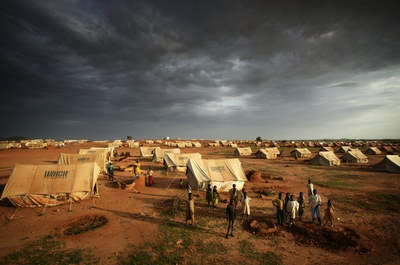 oversees the operation of twelve refugee camps with a population of nearly two hundred and fifty thousand Sudanese who have fled to Chad to escape death, mayhem, and ethnic cleansing. The rainy season in Chad ended more than a month ago. Now that the rutted, undulating roads are again passable, it is the season of war. Aiméry Mbounkap’s preoccupation with bad moments that arrive unexpectedly is the result of reports, as yet unconfirmed, about a column of Chadian rebels gathering to the south of here. The rumors have come from the nearby village market and they are perfectly plausible, given that war has broken out in Chad with near-seasonal predictability every year at this time in recent years. Inspired? Read more stories about aid work in my eBook.